of the title—and her own Midwestern identity. Our speedboat pitched side-to-side in the waves, and I braced my feet against the gunwale to stay seated. Sheens of icy water sprayed my face. The gray sky darkened and the cold wet froze my fingers around my fishing pole. It was August, and I was on a fishing trip in Lake Michigan’s Little Bay du Noc, near the western end of the Upper Peninsula. I had subjected myself to this trip, not because of my love of fishing, but because Bay du Noc was one of a half-dozen places in the Upper Midwest to claim the title of Walleye Capital of the World. Also, I had read that Baudette, Minnesota, had trademarked the phrase “Walleye Capital of the World” and was gunning for a federal patent. But how, I wondered, would the feds judge Baudette worthy of this title? Probably some cubicle-bound soul would read over the paperwork and rubber-stamp it. No one would count the town’s ‘Walleye Capital’ billboards, consider the size of walleye statues, or even, I assumed, go fishing. As a native of walleye land—I grew up in Maumee, Ohio, near the western edge of Lake Erie—I couldn’t let this stand. I decided then to visit every self-proclaimed Walleye Capital and suss out the true champion. Granted, I didn’t know how to fish. But that could be fixed. I also had a deeper reason for wanting to go. 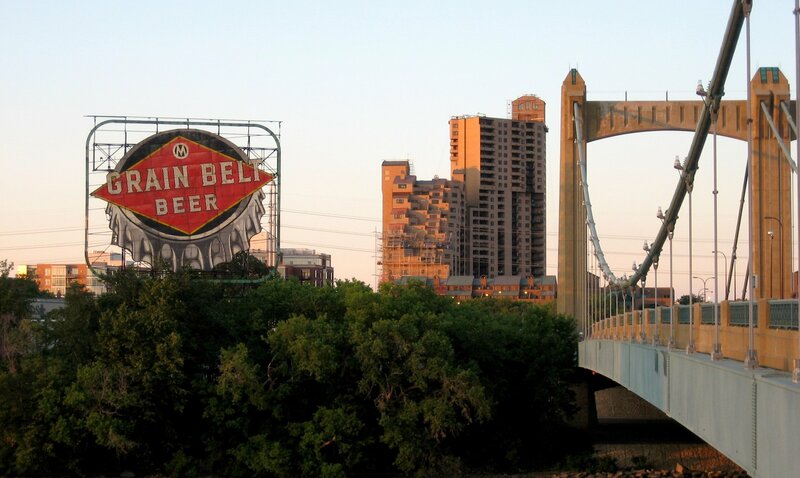 After living in New York for a decade, I’d begun to feel I was losing my Midwestern edge. My northern Ohio accent had mellowed into geographically-neutral newscaster-speak. A close childhood friend said I came across as an East Coaster. This did not sit well with me. I identified strongly with the Midwest and believed that, despite my move east, my home region still shaped my life in important ways. During sleepless nights, I’d wonder: If I wasn’t Midwestern anymore, who was I? Where did I belong? That’s how I came to be tossing on the freezing August waters of Little Bay du Noc, fishing pole in hand. I assembled a list of prospective walleye capitals, two of which were just a short drive from my hometown. So I flew back to Ohio and started my journey from Maumee, planning to hit the other capitals on an extended road trip. What better way to regain my Midwestern self, I thought, than by road-tripping into its semi-rural and watery regions to anoint the True Walleye Capital of the World? Port Clinton, Ohio, population 5,917 in 2017 , sits on Lake Erie’s Sandusky Bay. To get there, I left Maumee and drove for an hour through pancake-flat northern Ohio, the roads cutting across fields of corn and soy, past old farmhouses with wrap-around porches and through the occasional one-stop-sign town. I turned onto a road that hugged Lake Erie, which, weather depending, could range from muted blue to gray. Today, its waves crashed onto shore, a hangover from last night’s thunderstorm. I was headed to meet up with Jackie Tibbels, whose family owned Tibbels’ Fishing Charter and Marina. Her yellow-page listing had caught my eye, as it said she was one of Port Clinton’s only female boat captains. After driving past Port Clinton’s downtown, I spotted Jackie’s Bait and Tackle shop at the end of a gravel driveway. Jackie was dressed in a sweat shirt and jeans, her hair cut in a neat bob. The first thing she did was suggest we forget our fishing plans. After an electrical storm, she explained, the fish nestle into the bottom of the lake, weathering it out. We laughed. I, too, had been the girl who couldn’t fish. In truth, I had been fishing once. I was about six or seven when my dad drove my mom and me, an only child, in the station wagon to the wooded edge of a river. The bank sloped steeply toward the water, and as we neared the edge, my dad and I sat down on the grass, dry leaves crunching beneath us, while my mom stood a few feet back, wrapped in her heavy wool shawl. I watched as my dad flicked his wrist to cast the line, and I heard the sharp whirl, then a faint rushing noise as the line caught on a tree branch behind us. Dad, a wiry, determined man, first swore, then attempted to untangle the line, swore again, cut the fishing line from the tree, packed us back into the station wagon, and drove home. From Tibbles’, I drove to Jim’s Taxidermy and Gift Shop, owned by Jim Wendt. In the parking lot, I found Wylie the Walleye. Wylie was Port Clinton’s mascot, a five-hundred-pound, twenty-foot-long, fiberglass replica of a walleye. His star turn happens on New Year’s Eve, when a crane heaves Wylie high above the town square, slowly lowering him down as the crowd screams and the clock ticks to midnight. This spectacle alone made Port Clinton a serious contender for the Walleye Capital of the World. Wylie had been secured to a trailer. He was ramrod-straight and poised to propel forward. His top was grey-green, blending into gold along his side and his fins and white on his underside. The reflective nature of his eyes was captured by nine-inch glass pie pans lined with tin foil. His open mouth displayed rows of sharp teeth pointing inward, and his expression was robotic and cold, leaving me no doubt he was a predator. If Wylie were alive, he would have eaten me without remorse. Wendt led me into the back of his shop, through rooms reeking of formaldehyde and past a playpen for his grandchildren. His favorite room was his paint room, he said. On a wooden table were four turkey heads stuck on stakes, painted vibrant red and blue. A number of walleye skins, brown as wood, were hung up to dry. The skin of fish and mammals loses its pigment when they die, he explained. Wendt spends hours painting the fish scales, carefully adding blues, greens, and yellows. Walleye is a mainstay for his business, Wendt said. He mounts walleye with their mouths open, sharp teeth bared, appearing angry and dangerous, because no one wants to hang a helpless-looking fish on the wall. Eyes are the key to a convincing walleye, he told me. In order to perfect their glazed look, Wendt spent an entire year going back-and-forth with a prosthetic eye maker. He told me this as he reached into a container of fake walleye eyes, pulled one out, and handed it to me. Squishy and rubbery, it looked startlingly real. Back in the front of the shop, we talked about Wylie and other walleye capitals. Wendt’s wife, Pat, joined us. Jim reached down and pulled out a magazine that had reprinted an article I read on roadsideamerica.com about the various walleye capitals, along with photos of their walleye statues. “I just wish he [Wylie] looked as good as the walleye figures the other walleye capitals have,” he said. My next stop was Linwood, Michigan, whose ZIP code area had a population of 4,316 in 2016. If Lower Michigan is shaped like a mittened hand, then Linwood lies on the point between the thumb and index finger. I made straight for Frank’s Great Outdoors, an independently-owned outdoor store covering approximately 30,000 square feet. I’d been in airports smaller than this. Frank’s sold fishing boats that looked like mini battleships and row upon row of rods. Hundreds of lures hung along one wall—dark lures for sunless days, neon lures for dirty water, all with names like Fried Chicken and Trailer Trash Pink. Frank’s sold walleye-attractants, walleye-shaped mailboxes and walleye fingernail clippers. Frank’s children and grandchildren ran the business, and his grandson, Pete Gorsky, volunteered to show me the marina. Gorsky was tall and clean-cut, with wide shoulders, freckles, and startling pale green eyes. He wore a white button-down shirt tucked into his jeans. We climbed into his shiny pick-up truck and toured the family’s marina, clubhouse, and campground, talking about the different relationships that hunters and bird watchers have with nature. We talked about the Great Lakes’ diminishing water tables and the invasive zebra muscles. Gorsky worried about competition from national hunting and fishing megastore chains like Cabella’s and Pro Bass. He shared with me the difficulties and benefits of working with family, which was, in his opinion, more fun than going fishing with family. At that point, I fell in love with him. Just a little bit—we’d only known each other for about forty minutes, after all. Gorsky and his brother Andy tried to pressure the store’s walleye expert, Ernie, to take me out fishing. But Ernie’s horror at taking a novice fishing was so poorly masked that I didn’t press it. Besides, I’d already eliminated Linwood as a walleye capital contender—driving around, I hadn’t spotted any walleye statues or billboards. A true capital needed more obvious pride. Verdict: No walleye capital, but I’d go back for a date. The rest of the walleye capitals were far enough from my hometown to call for a road trip, and I asked my cousin Bob to join me. Bob grew up twenty minutes from me, but while I was raised in the suburbs, he grew up on his family’s horse farm. He knew how to fish, his Levi’s were worn from use, and he could talk guns in mind-numbing detail. Bob would also be good company. For his part, he said it sounded like fun. It was August when we drove Bob’s truck to Gladstone, Michigan, population 4,926, one of the towns on the capital of Little Bay du Noc. 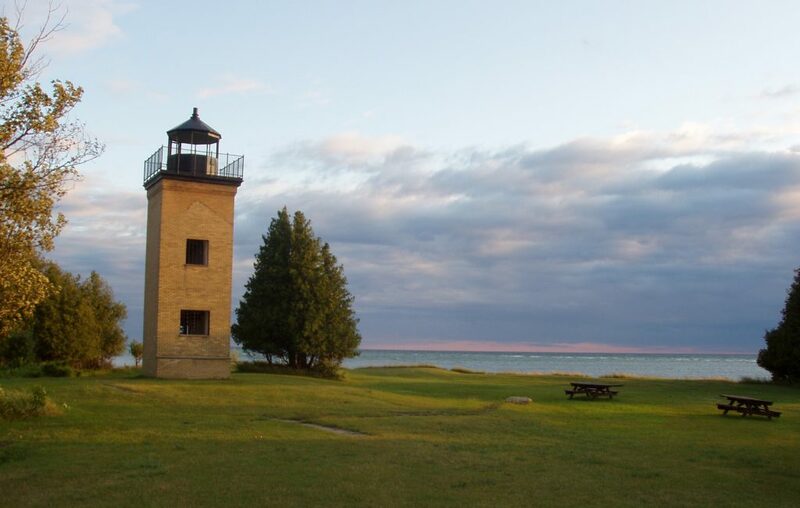 It was part of Michigan’s Upper Peninsula, which touches three Great Lakes and is a sliver of wooded paradise. Unwilling to visit another walleye capital without learning how to fish, I hired a guide named Captain Ken. The night sky was black when we arrived at the marina at 5:30 a.m., dashing my assumptions of fishing as a mid-day, six-pack-in-tow activity. I was surprised to see Ken was in his thirties, as over the phone his slow manner of speaking and sparse use of words reminded me of old Midwestern farmers. Ken sped out into the bay, used sonar to locate a school of walleye, and stopped directly above them. He handed Bob and I our poles, which were fitted with sinkers that dragged the line down to walleye depth. He even baited our hook with night crawlers. Bob told me this was normal, but I knew we were cheating. Out on the water, ominous gray clouds roiled across the sky and I shivered from the cold, despite wearing every layer I had packed—two t-shirts, a long-sleeve shirt and a lightweight jacket. The waves kept increasing, and, after two hours, my hands cramped with cold around the fishing pole. Despite our fancy gadgets, we’d caught zero fish, although occasionally a fish nibbled the worm off my hook. That’s when Ken told us July and August were the worst fishing months of the year. This was because mayflies, bugs that look like a cross between a moth and a dragonfly, hatch by the thousands from the lake and descend en mass to blanket parking lots, store windows, etc. Their bodies covered the lake, creating an all-you-can-eat buffet for walleye, making it easy for fish to ignore the leech on my hook. I cringed. Of course, I’d inadvertently planned this trip for the fishing dead zone. If anything, this trip had me feeling even less Midwestern and more like an ignorant city person than before. More time passed. The boat pitched, and I was regularly sprayed with icy water. There was no conversation. Ken, as I suspected, was the silent type. So was Bob, I was learning. I had never imagined fishing could be so boring. I had pictured myself kicking back in a boat, warmed by the sun, water gently flowing around us, as I reeled in fish after fish while sharing conversation and a sense of community with everyone on the boat. At no point had I envisioned myself exhausted and hunched over to protect myself from lake spray. That’s when I felt the first real tug on my line—I’d hooked something!—only to crank seaweed out of the water. 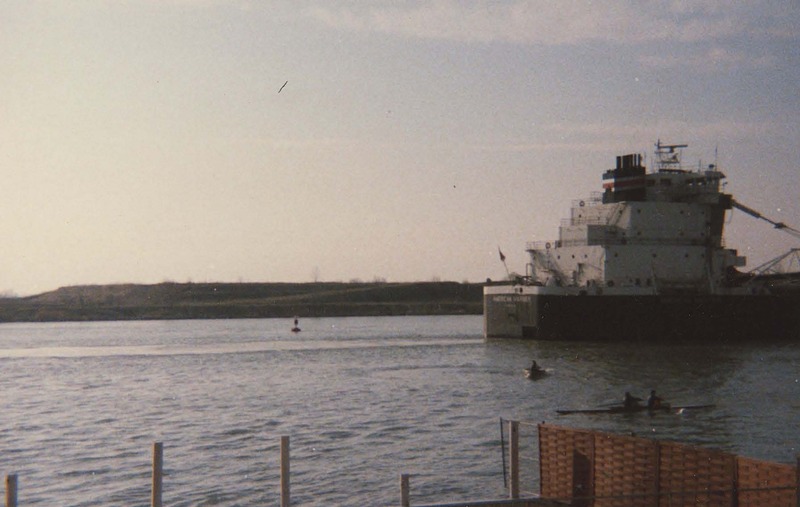 That afternoon, Bob and I tooled around Gladstone and nearby Escanaba. We spotted no walleye statues or billboards proclaiming walleye supremacy. People we talked to were as likely to reference perch and good hunting when it came to local pride. In my mind, they needed more civic walleye pride to make the cut. Rating: Not enough walleye loyalty to cut it as a capital. We took a leisurely route to Ray, Minnesota, driving along two-lane country roads, winding around gentle hills and farm fields, where golden barrels of rolled hay sat in the sunshine. Dark green woods separated the farms, and the small yellow and purple flowers along the roadside blurred as we passed. I stuck my arm out the window to feel the rush of the warm, dry air. We passed signs for towns named Iron River, Iron Town, and Ironwood, homage to the iron mines that once employed half the area, and whose closure devastated local economies. We stopped for the night in Virginia, Minnesota, a town consisting of a motel, a combination convenience store and bar, and a gas station advertising live bait. In an effort to force myself to stay present in my surroundings, I had deliberately not packed playing cards or a book. Standing in the gas station/store/bar parking lot, I was so bored as to be almost angry. I wondered what I was doing out here, what I was trying to prove. Bob booked a hotel room in which someone had taped a sign over the sink: “No fish guts in the sink.” We opened a couple of beers, talked about nothing for an hour, and then Bob went silent. I flipped on the TV, and we began watching an old black-and-white film. Lightning burst, followed by a crack of thunder. The sky opened up and rain poured down. The TV died with a fizzle. I opened the door to the outside, letting in the amber late-afternoon light, and watched the rain, my restlessness growing. I headed to the campground where I would be sleeping and fell asleep to the patter of rain and call of loons. The next day we reached Ray, Minnesota. We drove around, only finding a few buildings and railroad tracks. After fifteen minutes, Bob insisted we move on, and I didn’t argue. After crossing the short bridge over Baudette Bay, we were greeted by a Minnesota-shaped sign reading: “Welcome to Baudette, Minnesota/Home of Willie the Walleye/Walleye Capital of the World.” Just past the sign loomed a walleye statue bigger than many speedboats. 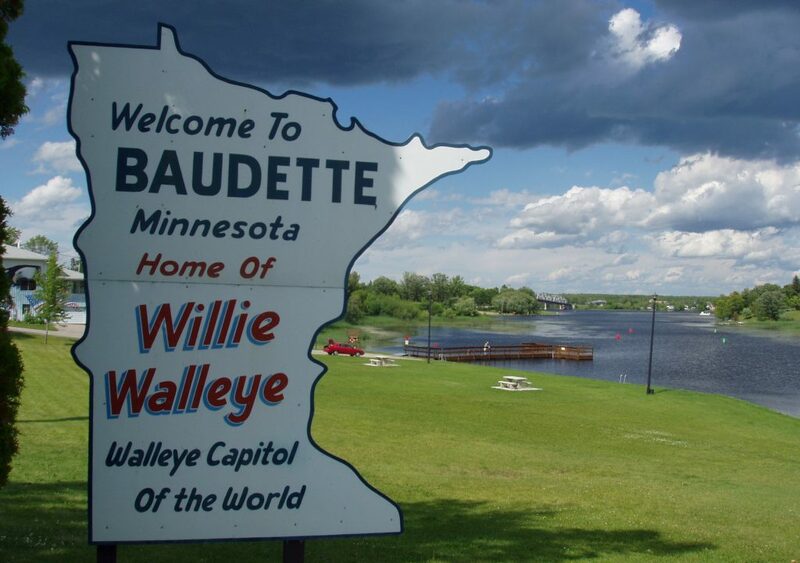 Baudette, the town trying to federally trademark the phrase “Walleye Capital of the World,” is in the northwestern-most corner of Minnesota and has a population of 1,106. Outside the town we spotted a large wooden sign rising out of a grassy field with “Walleye Retreat” hand-painted on it—our lodgings. I took the owner’s names—Pete and Terri Fischbach—as a good omen. The next morning was sunny and warm when we joined Pete and Terri on their boat. Pete’s peppery hair peeked out from under his baseball cap, his sleeveless T-shirt showed off his biceps, and his walrus moustache complimented his smile. Terri had stuffed her long, wavy hair under a baseball cap. She smiled easily and frequently and laughed like a woodpecker. She and Pete seemed invigorated by the challenge of teaching me to fish. And five Walleye Capitals into my quest I was desperate to finally—finally!—catch a walleye. While the boat rocked gently, Pete and Terri told us how they had met in seventh grade and gotten married at twenty-five, almost twenty-five years before we met. They used to own a farm, until it got too hard. 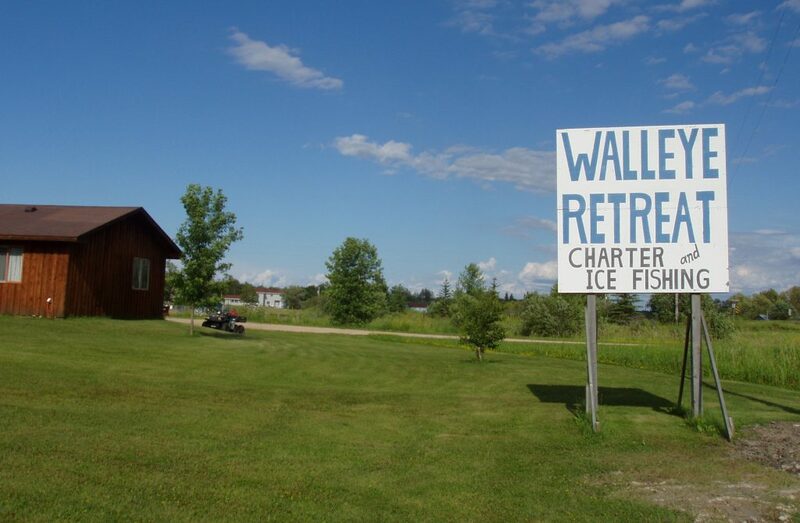 Together, they built the Walleye Retreat by hand. Bob and I quickly ate our bananas, put the peels in the garbage, and picked up our rods. A few moments later, we heard a small splash as Pete tossed the peels overboard. “We’ll donate that to the lake,” he said, jumping around, waving his arms and wriggling his fingers, yelling “Voodoo, voodoo, voodoo!” He settled down, put the boat into gear, and we sped toward shallower water. Then it happened. We started catching walleye. Well, Pete started catching walleye. He caught four within twenty minutes. Most of them were fourteen or fifteen inches long, and he slapped them unceremoniously in the ice-filled cooler, where they continued to wriggle. Terri got nibbles, but never managed to set the hook. I began to think that I’d jinxed our trip by eating bananas every day. But for the first time in ages, I felt hopeful. We drifted lazily. This was fishing as I imagined it: the soft sun, the gentle sounds of water, talking with Terri, Pete, and Bob about politics, healthcare, kids, anything really. The more I enjoyed myself, the less I worried about being the type of Midwesterner who enjoys fishing. Then I felt a strong tug on my line, enough to bend my pole. I jerked up, setting the hook. “Oh, she’s got one on!” Terri shouted. My pole felt impossibly heavy, and I braced its base against my stomach, wondering if it would leave a bruise. I forgot what Pete and Terri had told me about strategically bringing in a fish—something about first reeling the line, then letting it go slack so the fish wouldn’t break the wire. I just cranked the reel, hard. I don’t think the fish fought; if it did, I didn’t notice. It all went so fast. I struggled to force the reel around, the pole bending deeply under the fish’s weight—would it break in half? The line seemed to be gliding through the lake, but I wasn’t sure. The water was a dark void with few ripples. Pete held a net scooper over the side of the boat. Everyone looked down expectantly. And then a walleye slid out of the water and Pete nabbed it with his net. He wrangled the fish off the hook and held it up to a measuring stick. It was nineteen inches long, by far the biggest walleye anyone had caught today. “Well, hold it up for a photo,” Pete said, smiling. Bob reached for his camera. I avoided the fish’s toothy mouth, instead grabbing it with my hands. It was slick, cool and firm, and within seconds it thrashed from my hands onto the boat’s floor. I had assumed I would feel guilty killing a fish, but I didn’t. Not really. At that moment, I just scampered across the boat after my walleye as it flopped wildly. I waved Pete away when he tried to help. I finally pinned the fish to the ground, its dorsal fin cutting my hand. I held up the fish, and it stared at me unblinkingly. I was elated, smiling and laughing at the same time. “Say cheese,” Bob said. 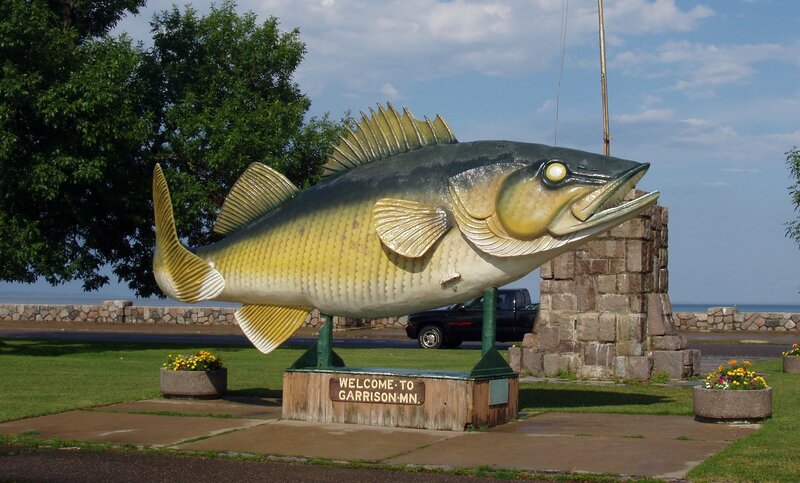 That afternoon, we drove past a sign that proclaimed: “Welcome to Garrison, total population 341.” Garrison’s downtown, which sat on the inland lake Mille Lacs, consisted of a few motels, bars, restaurants, and an antique gun and knife store. Next to the bright blue lake was the biggest walleye statue I’d seen. A rainbow arched across the sky and over the statue, as if to make a point. Bob and I had booked seats on a “party boat,” which, based on online photos, looked like a bunch of attractive people whooping it up over beers on a boat. I could get into that. But once we reached the marina, I realized this was not to be. About half of the twenty passengers on the pontoon-like boat were children. Out on the water, the bugs were biting, but the fish weren’t. The kids got bored. Second boy: “Where are the fish? The boat grew quiet as the night darkened. The youngest, most rambunctious boy fell asleep in his mother’s lap. A woman’s cigarette glowed. Everyone relaxed into each other, gazing silently into the blackness of the lake. I leaned forward onto my elbows, looking out at the water and watching the glowing bobbers, knowing I wouldn’t catch a fish, that this would not make me any more or less Midwestern, and that life at this moment was good. The next day, Bob and I scrapped the idea of driving seven hours to Garrison, North Dakota. I justified this because I hadn’t seen any local walleye statue photos posted to the Internet. Flying back to New York, I still couldn’t pronounce the true Walleye Capital. In my mind, Port Clinton, Ohio, and Baudette Minnesota were tied, as both had a strong walleye capital identity and solid community pride around it. Perhaps more importantly, I also didn’t feel any more Midwestern. I spent the following New Year’s Eve in Ohio for Port Clinton’s midnight walleye drop extravaganza. We arrived at ten p.m. The temperature hovered near zero, and I was shivering despite my ankle-length coat and hat. The wind whipped off Lake Erie a stone’s throw away. People milled around downtown, past the steamed-up windows of shops and restaurants open late for the festivities, and tents that hosted everything from kids’ games to a bar. For warmth, we ducked into Best Popcorn Co, where the menu included walleye-flavored popcorn. I must have made a face, because the woman behind the counter said, “Don’t worry, honey, it’s really just spicy Cajun.” I ordered vanilla butternut. Without a doubt, this spectacle nudged Port Clinton ahead of Baudette to claim the Walleye Capital of the World title. Of course, I haven’t yet been ice fishing in Baudette, where, I was told, vehicles drive onto the ice to deliver pizzas, and some ice fishermen watch TVs powered by generators inside their fishing huts. When I moved to New York, I became known as the Midwesterner. And I liked it—it kept me feeling close to my roots and my culture. Over time, as my own sense of this identity faded, I worried that I had lost something essential. My quest for the Walleye Capital became, more than anything, a last grasp at what I believed to be an authentic Midwestern identity. But I had come to realize that my Midwestern-ness wasn’t defined by stereotypes like walleye or fishing any more than being a New Yorker is defined by eating bagels and hailing yellow cabs. 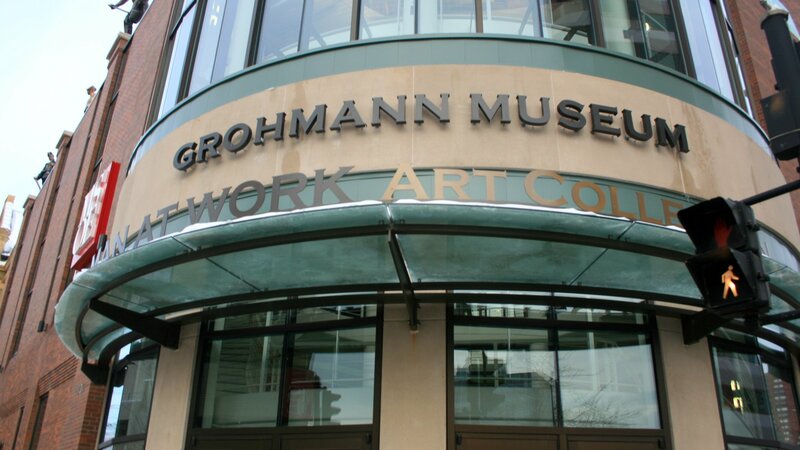 My connection to this place runs much deeper than that. Amy Braunschweiger recently moved to Columbus, Ohio, thereby resolving her identity crisis.